With Easter fast-approaching I thought it was about time I shared these little guys! Making novelty shakers is a fun way to make use of the plastic yolks from ‘Kinder Surprise’ eggs if you are lucky enough to have access to them. Clean off the plastic yolk and fill with dried rice, beans, beads, sand… you can have fun trying out all sorts of different fillings to compare the different sounds. Note that if you are making shakers with ‘normal’ plastic eggs you may well need to block any small holes in the plastic. Close the egg securely. Kinder Eggs are good for this activity as they are hard to open. If you are using other plastic eggs you will need to tape securely around the join. Either way, you may well need to remind your child not to try to open them or squeeze them too hard. It goes without saying (but I’m still saying it) that you should use your best judgement as to whether this activity is suitable for your child. Wrap blue painter’s tape around the egg with the top edge of the tape positioned just above the join. Make small cuts along the bottom edge of the tape and fold the tape under the egg. Cut thin strips of tape to make the straps for your minion’s overalls, and draw pockets, gloves or whatever details you like onto the tape. Choose one or two googly eyes and position them however you like. Note that PVA glue will not hold the eyes on firmly. If your children can’t wait to finish their minion, just take a note of where they want the eyes and super-glue them on later. Alternatively you could use round white stickers or a little white-out fluid for this stage. Complete your minion’s face and head with a mouth, strap for goggles, hair, eyelashes… just whatever details look fun. 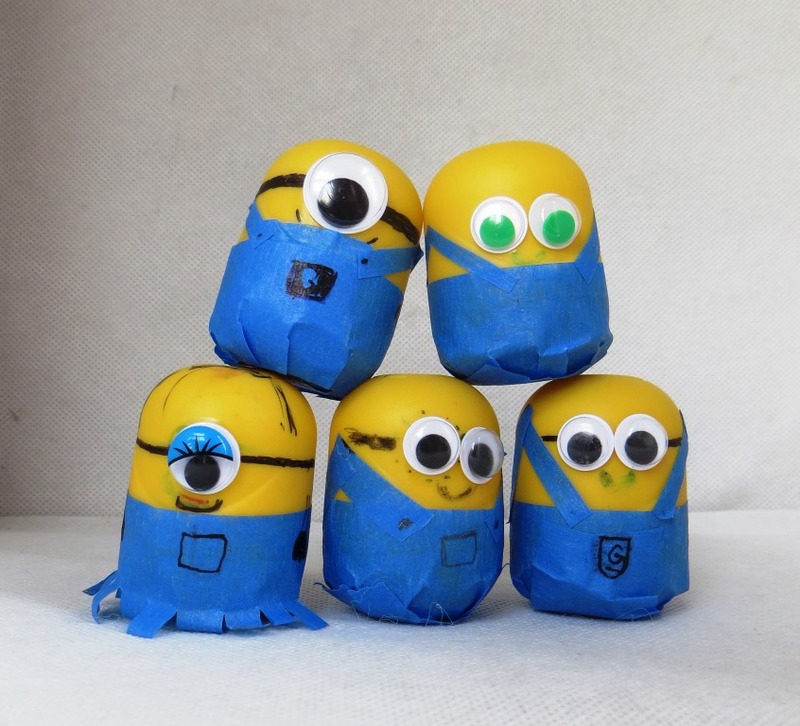 As you’ll see from these pictures – we definitely made these minions ourselves! I do not have a gift for crafts and my kids are all young, so you can see that this is a pretty straightforward activity. E insisted her minion should be a girl; setting aside my thoughts about whether girls necessarily need to wear dresses and have blue eyeshadow I’m amused by her ‘glamour-minion’! These particular minions like to shake about and sing along with various minion-style songs – a great way to join in with pretty much any song without knowing the ‘real’ words – bonus!